We received the following report of a possible lake monster encounter in 2010 the actual event occurred in summer 2001. "My name is (edited for witness privacy) and I believe I have seen a "lake monster" in lake superior. I live in Thunder Bay Ontario Canada and my sighting had taken place on July 2001 at Wildgoose Park. I was working for the township doing park maintenance the time was approximately 7:45 or so in the morning and I was standing on the CN railway, which runs through the park grounds, watching a fishing troller in the distance and had noticed a huge wake happening off to my right which appeared to be 20 - 30 ft off a point ( kinda hard to describe easier to show ) as the wake increased something rose out of the water which appeared to be 8ft high, ( my first thought was it was a bird, but I am very familiar with Northern Ontario birds and have never ever seen one rise out of the water or for that matter create a wake in the water like a speed boat ) as the object rose out of the water it then leaned forward and disappeared behind the point. The wake this object left behind it was approximately 10 ft or longer, and the duration of this encounter had lasted maybe 30 seconds from start to finish." Our thanks to the witness for sharing his experience. Can you add further information to this report? 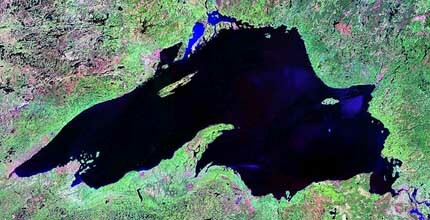 Have you seen something similar in Lake Superior or another Canadian lake? If so, please contact us at admin@psican.org Your privacy will be protected, and confidentiality is assured.